Strategic Management Blog: From Theory to Practice What’s the Difference between Strategic Thinking and Strategic Planning? Recently a client asked a very simple, and yet extremely complex, question: “What’s the difference between ‘strategic thinking’ and ‘strategic planning’?” Great question! A quick Google search reveals that academics have pondered and debated this question since the early 1990’s. One extremely helpful scholarly overview can be found in the June 1998 volume 31 of Long Range Planning, in a very high-level discussion by Loizos Heracleous entitled “Strategic Thinking or Strategic Planning?” Heracleous presents a variety of perspectives from business academicians differentiating between the two. While these scholarly discussions are intellectually stimulating, we are left lacking a simple and practical explanation to differentiate between the two. At LBL Strategies, we suggest that “strategic planning/management” and “strategic thinking” exist in a symbiotic relationship. The two not only work together…but they require each other. Strategic planning without strategic thinking will digress into a sluggish and lifeless process of setting goals and measuring objectives. Strategic thinking without strategic planning/management will cannibalize itself in a quest for structure and process. Strategic thinking informs strategic planning/management. Strategic planning/management gives voice, action and structure to strategic thinking. In working with our clients, we find that most have a relatively strong understanding and appreciation for the value of strategic planning/management. Likewise, we find that many are hungering for an organizational culture which is bettered trained and more engaged in thinking strategically. So in our attempt to remain practical and engaged in the “real world” of our clients’ business, we underscore that at its essence, “Strategic Thinking” is a way of viewing challenges and opportunities from a variety of perspectives and altitudes, in order to proffer the very best solutions and directions. It is the habit of visualizing alternative futures for the organization and their impact on others. It’s not just a way of thinking what could be, but also a way of seeing what should be. That said, training and cultivating an organizational culture to think strategically is a vital tool throughout the strategic planning process. During the high-level strategy formation phase, leaders thinking strategically will drive alignment around analyzing the opportunities from the widest possible perspective and understanding. 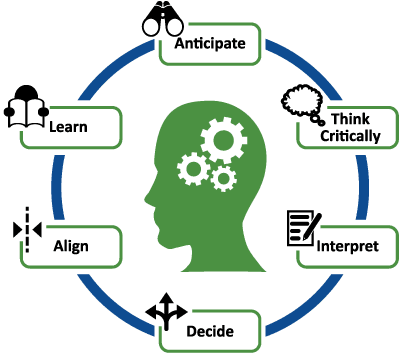 During the operational and implementation phase, a strategic thinking organization will ensure that the higher level strategic direction cascades throughout the day-to-day decision making at all levels. C-suite executives, middle managers, and front line staff are entrusted with the freedom to think through solutions and trade-offs, to ensure each decision is best aligned with the overall strategic direction. Finally, during the all-important evaluation and control phase, strategic thinking ensures that an organization is measuring those drivers which best lead to success of the overall mission. Strategic thinking is more than just “thinking outside the box” . . . it is also knowing which box to think outside of!